Bill Brown & F Kirk Cup. Singles Knockout runner up - Ian Russell. Doubles Knockout winners - Faron Trueman & Neil Inglis. Doubles Knockout runners up - Ian Russell & Jimmy Middlemas. 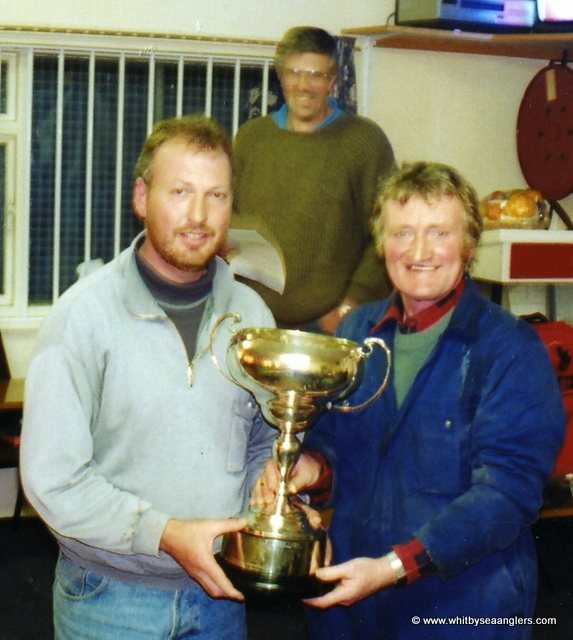 Open Five winner - Denis Thompson. Heaviest Fish in competition - Neil Inglis - 28 lb 08 oz. Heaviest Fish out of competition - Denis Thompson - 10 lb 10 oz. Christmas Match winner - Faron Trueman - 2 lb 14 oz. Greatest Number of fish - Denis Thompson - 67 fish. 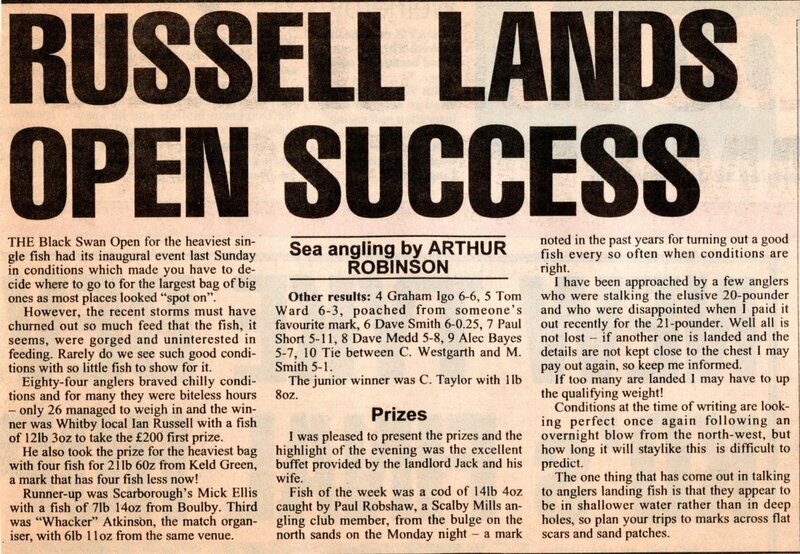 Heaviest Bag of Fish in competition - Neil Inglis - 31 lb 08 oz - 2 fish. 2nd - Adrian Kelly - 3 lb 07 oz. Total weigh in for season 1,528 lb 02 oz. Total number of fish - 602. Notes:- PDH 18-12-2012 taken from ledger. 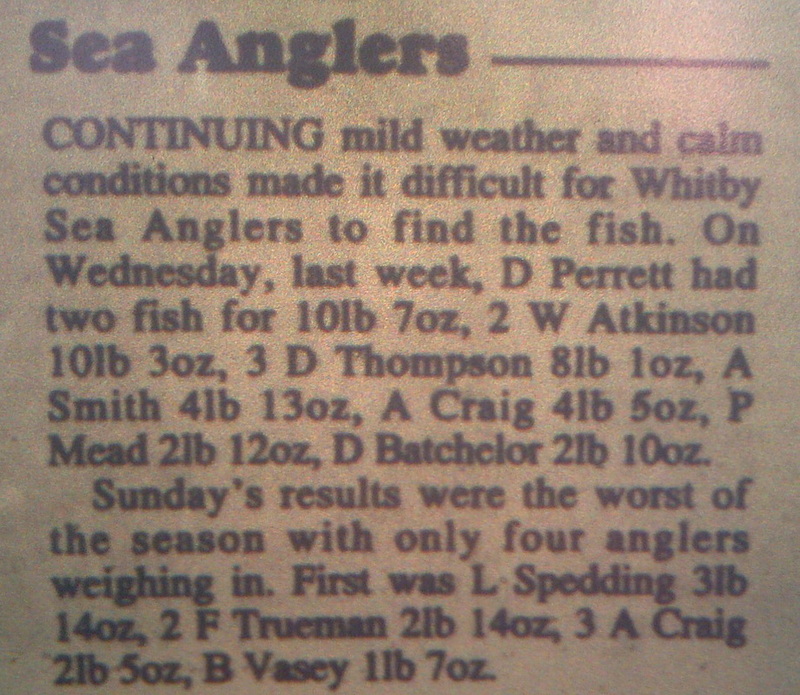 28th September 1994 - Denis Thompson Heaviest Fish - 7 lb 09 oz, part of a 12 lb 05 oz bag of 2 fish. 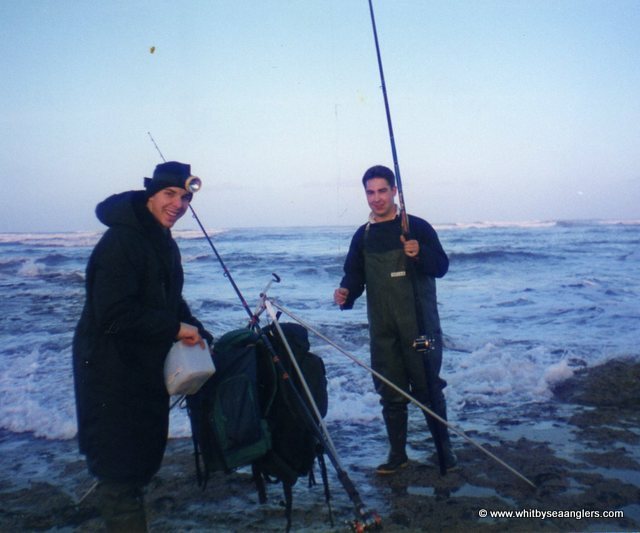 2nd October 1994 - Denis Thompson Heaviest Bag of Fish - 15 lb 14 oz - 7 fish. Paul Short - 16 lb 00 oz. 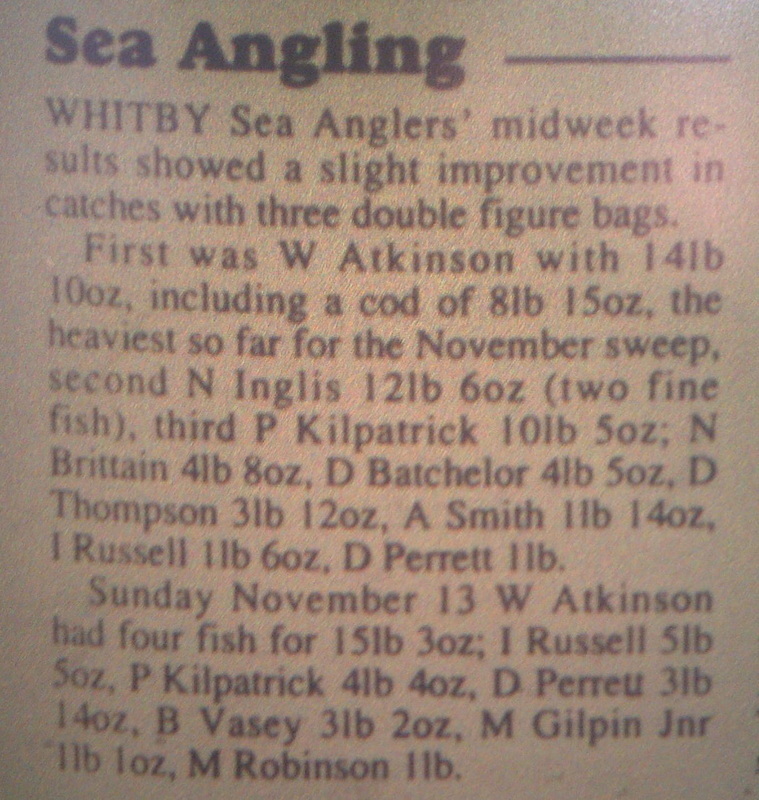 9th November 1994 - William Atkinson Heaviest Fish - 8 lb 15 oz, part of a 14 lb 10 oz bag of 3 fish. 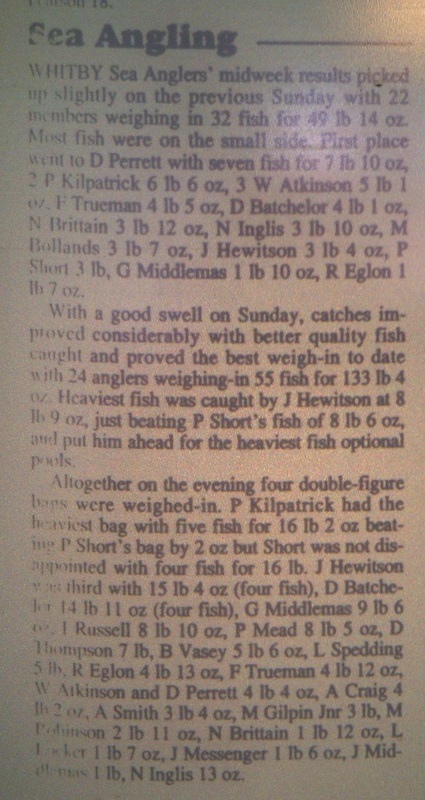 Footnote around 7th December 1994 - Denis Thompson Heaviest Fish out of competition 9 lb 00 oz. 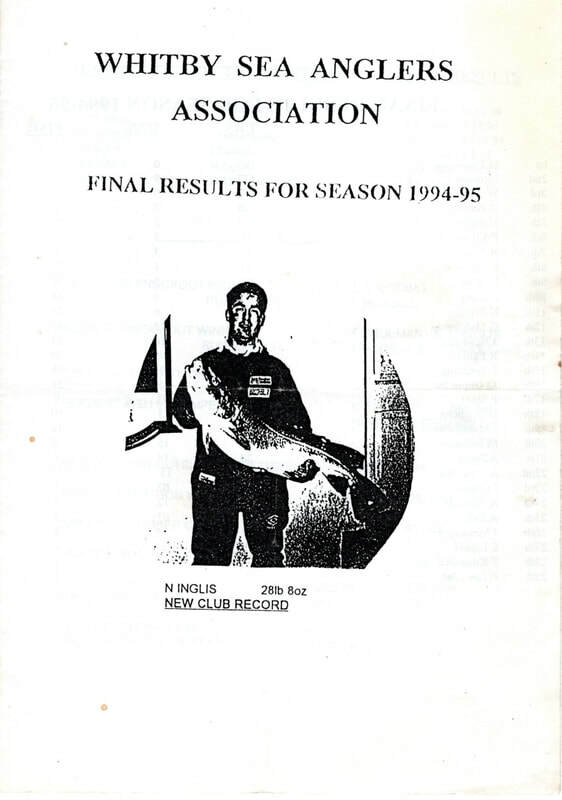 26th February 1995 - Neil Inglis Heaviest Fish and New Club Record - 28 lb 08 oz, part of a 31 lb 08 oz bag of 2 fish. 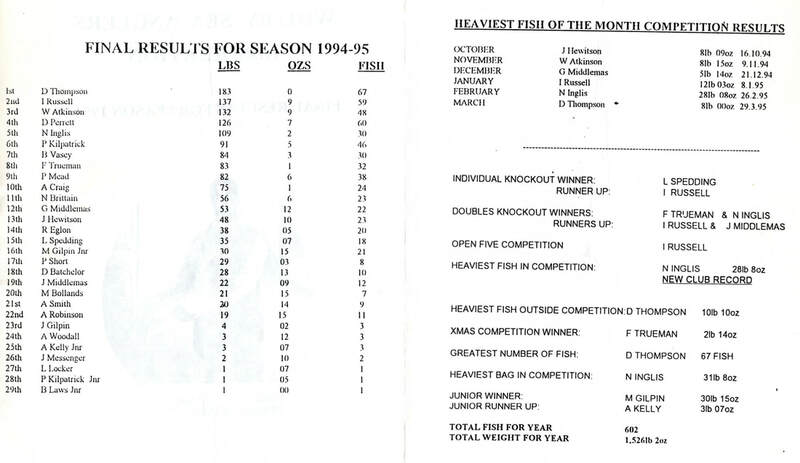 1st March 1995 - Bernard Vasey Heaviest Fish - 5 lb 08 oz. 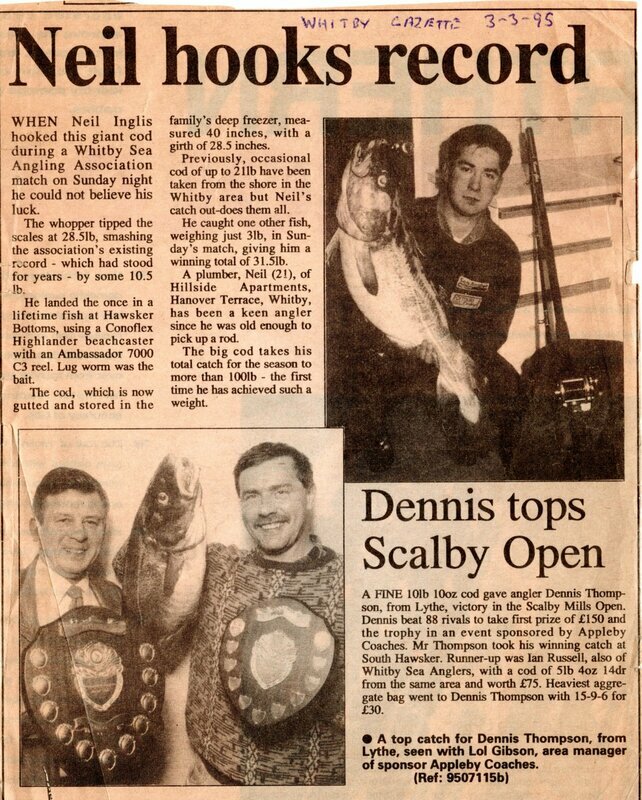 5th March 1995 - Denis Thompson Heaviest Fish - 5 lb 08 oz. 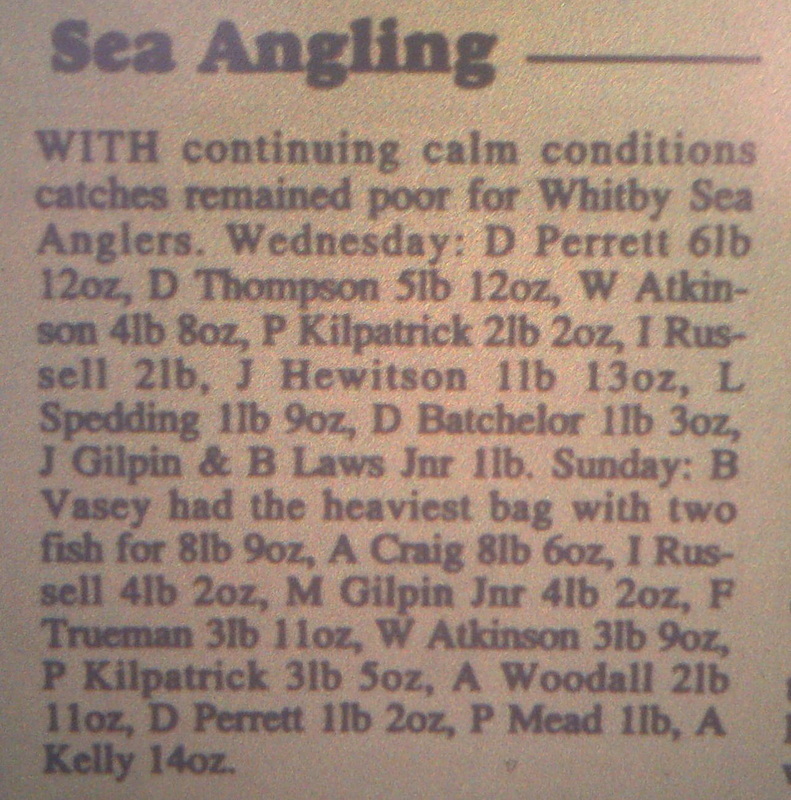 15th March 1995 - Denis Thompson Heaviest Fish - 5 lb 14 oz. 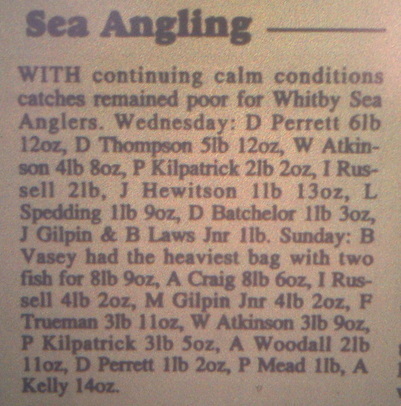 23rd March 1995 - Denis Thompson Heaviest Fish - 8 lb 00 oz part of a 10 lb 10 oz bag of 2 fish. 23 members entered and 9 weighed in. 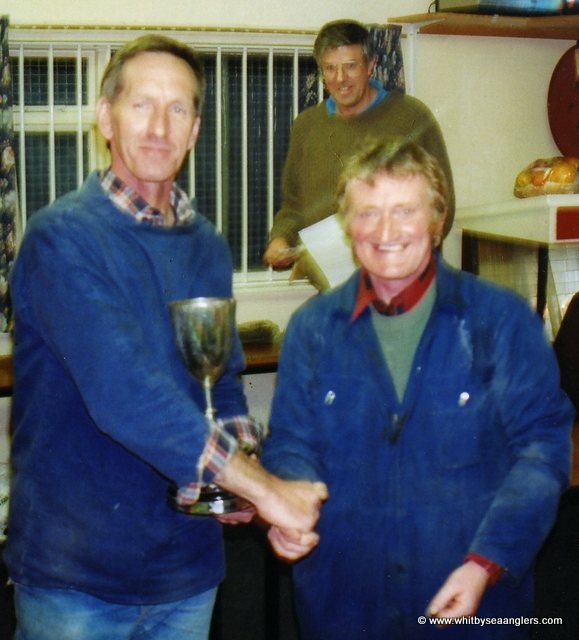 Bernard Westgarth WSAA Open Winner, receives his prize from Chairman William Atkinson - 17 lb 08 oz - 6th November 1994 Photograph by Bernard Vasey. 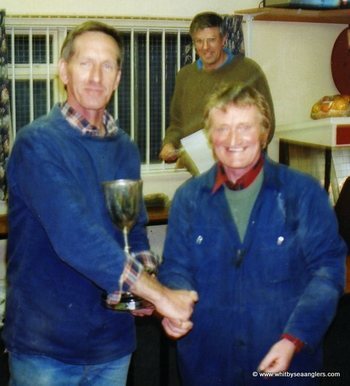 Tom Ward receives his prize from Chairman William Atkinson for the Heaviest Fish - 10 lb 01 oz - 6th November 1994 Photograph by Bernard Vasey. 19 members entered and only 3 weighed in!! 27 members entered and only 6 weighed in!! 2 lb 14 oz - 2 fish. 2 lb 02 oz - 1 fish. 2 lb 01 oz - 2 fish. 19 members entered and 6 weighed in. 21 lb 06 oz - 4 fish (HF 12 lb 03 oz). 8 lb 15 oz - 2 fish. 7 lb 07 oz - 3 fish. 6 lb 03 oz - 3 fish. 4 lb 13 oz - 2 fish. 15 members entered and only Bernard Vasey weighed in. 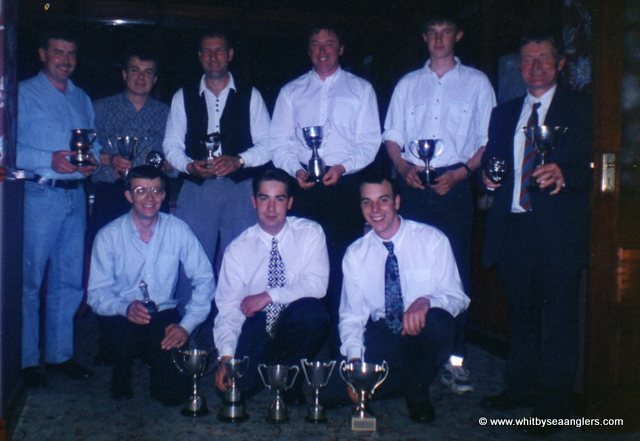 Annual dinner presentation night 1994 -1995 Season. Front row: Bernard Vasey, Neil Inglis and Faron Trueman. 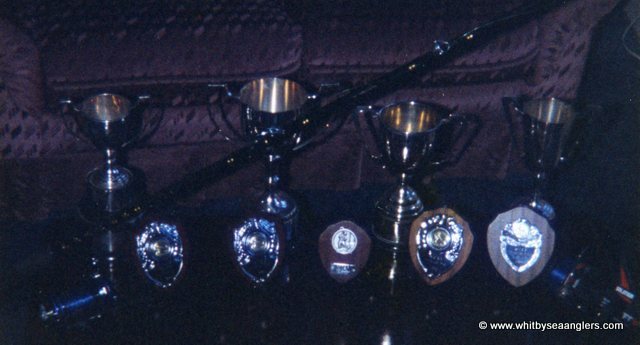 Neil Inglis trophies for 1994 1995 Season.